Noticing New York: Will Thompson Kick It Off Right In Brooklyn? Here is some news. 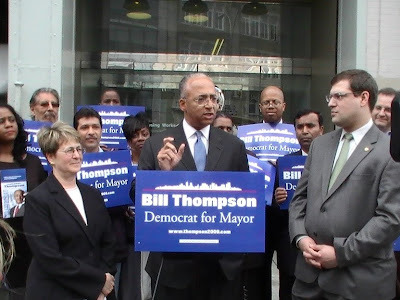 Bill Thompson, City Comptroller and candidate for mayor (endorsed by the Working Families Party last night) will be in Brooklyn at Borough Hall tomorrow morning to start a five borough tour. Brooklyn should perhaps be flattered that Thompson is starting with Brooklyn. Does that bespeak a certain preeminence? It should be easy for Thompson to come up with some stiff criticism of the Atlantic Yards mega-project now, given the project’s complete degeneration and the recent execrable and easy-to-target multi-mullion dollar giveaways to Forest City Ratner by the self-impoverishing MTA and ESDC. Yes, Noticing New York, as is its wont, is zeroing in on development issues. Sure, there are other issues of importance but aren’t development issues truly key for the anti-Bloomberg candidates to distinguish themselves from Bloomberg? The other candidates for mayor, Tony Avella and Billy Talen, appreciate this thoroughly. If Thompson doesn’t. . . Forget it, man! Also if he can’t recognize Atlantic Yards as the city’s number one boondoggle then we are really due to be raked over the financial coals if he ever gets elected. Let’s see what we hear from Mr. Thompson tomorrow.